Punisher War Journal (1988) #5 VF/NM 9.0 Marvel,Jim Lee; $4 Flat-Rate Shipping! Punisher War Journal (1988) #19 VF/NM 9.0 Marvel,Jim Lee;$4 Flat-Rate Shipping! Punisher War Journal (1988) #40 NM- 9.2 Marvel Comics;$4 Flat-Rate Shipping! 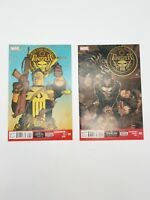 Punisher War Journal (1988) #35 NM- 9.2 Marvel Comics;$4 Flat-Rate Shipping! Punisher War Journal (1988) #34 VF/NM 9.0 Marvel Comics;$4 Flat-Rate Shipping!